..... Balance Trading .....: Who Is So Wrong? Stocks or Bonds? A majority of companies have reported excellent earnings and outlook. Market is still counting on some sort of "debt ceiling / spending grand bargain" to be agreed up on soon. I think the stock market is so mesmerized by so called "grand bargain" that it's not even willing to consider other outcomes including a default. The bond market, however, is not that naive. Yields on US treasury notes and bills are currently just about the same level as they were back in Oct of 2010 when the financial world as we knew it was about to end. 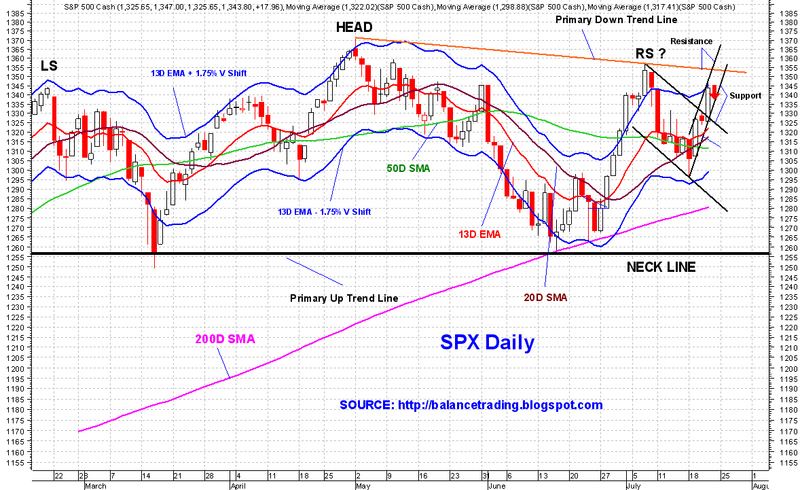 I don't know what is going to happen, but it seems to me being long in stocks and indices now is very risky. My plan is to stick with my short positions so longs as my signal, SGS, is short. 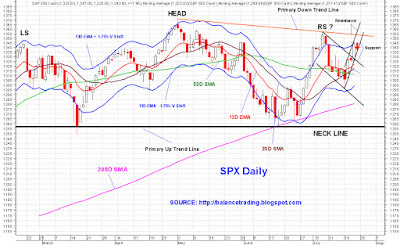 SGS would turn neutral if the primary down trend lines in major indices are broken (orange line on the SPX chart above), and then would go long if major indices put in new highs (1370 and higher for SPX).